Losing a leg or arm by amputation can be a catastrophic experience that causes physical, mental, and emotional burdens on the victim. The victim's family is also faced with a lifelong financial burden of paying for hospitalization, medical expenses, recurrent surgeries, rehabilitation, and replacement prosthetic devices, all of which can be extremely expensive. The following sections outline this issue in more detail. If you have further questions, just give us a call. We’d be happy to speak with you! How do Amputations Normally Arise? Choose Us to Protect Your Recovery! Surgeons perform amputations. They're usually the only effective treatment for severe infection, a medical condition like diabetes or cancer, or from severe injuries that have broken bones and damage blood vessels. 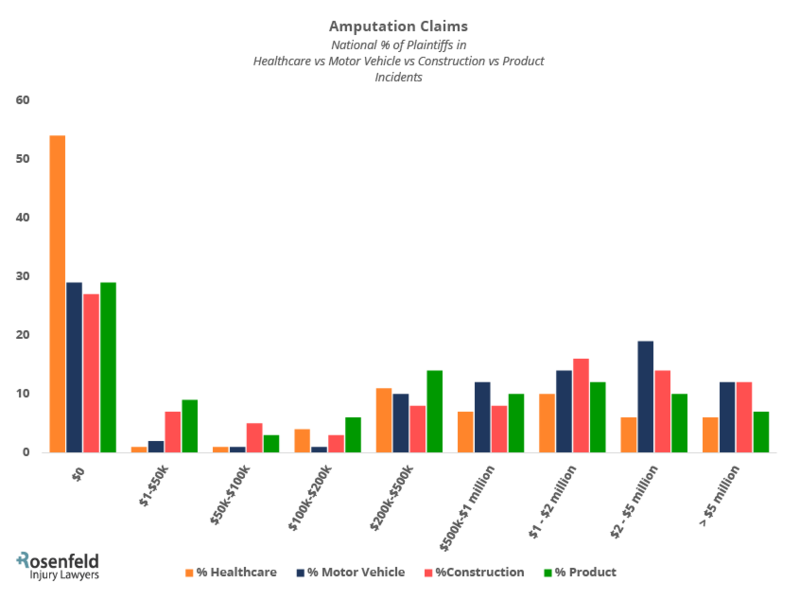 The most common accident-related causes that lead to a leg or arm amputation include the ones listed below. In March 2016, OSHA (Occupational Safety and Health Administration) released a report revealing that over 10,000 severe injuries occurred in hazardous workplaces the previous year. 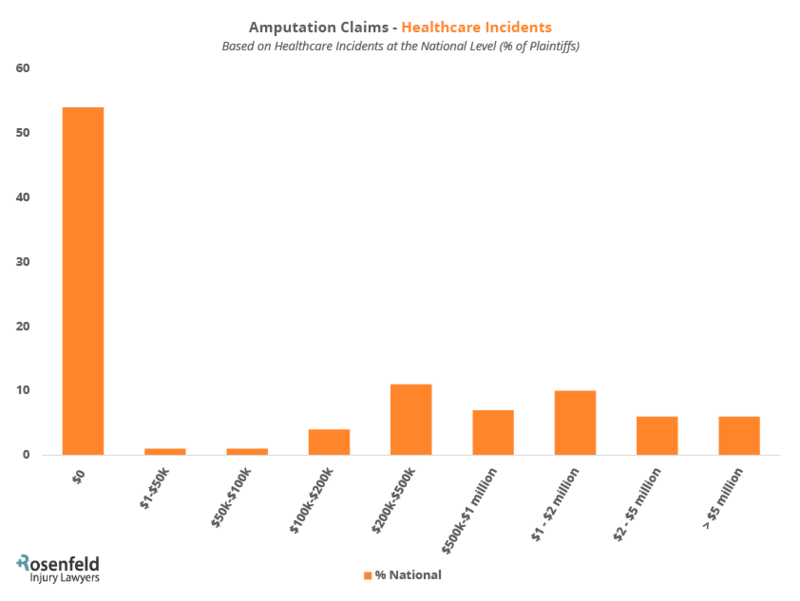 Of these injuries, more than 7500 victims needed hospitalization, and approximately 2640 workers required amputations. This data was collected from 26 states, including Illinois, that have developed higher safety standards compared to federal regulations. 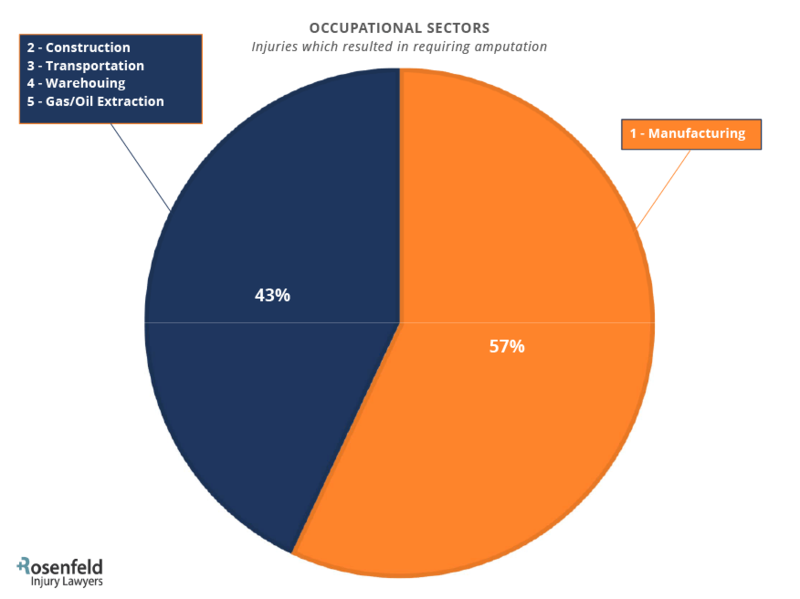 More than 57% of all on the job injuries resulting in amputations occurred in the manufacturing industries, which totaled more than 25% of all workplace-accident related hospitalizations. 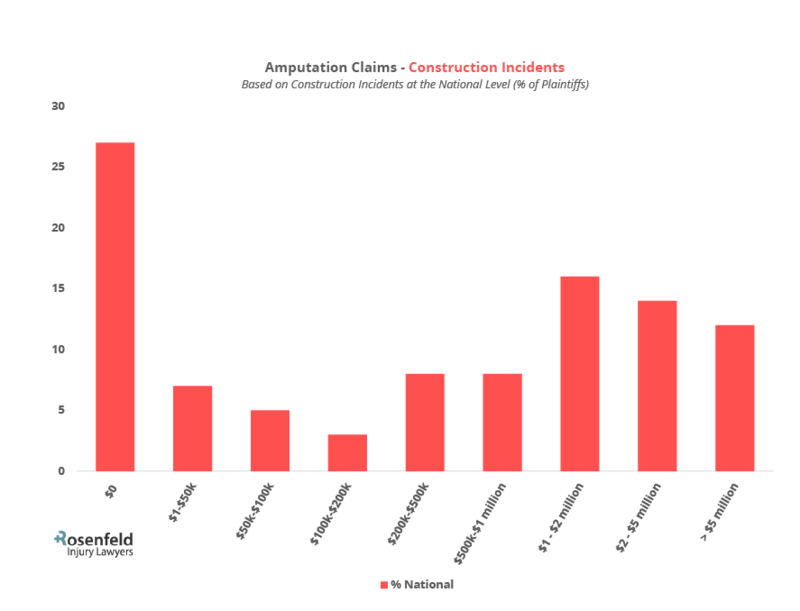 The second, third, fourth, and fifth most dangerous occupations involving amputations included construction, transportation, warehousing, and gas/oil extraction, respectively. While this number seems staggeringly high, the federal agency in charge of maintaining workplace safety estimates that one-half of all injuries occurring on the job are never reported. Many companies attempt to hide the unsafe conditions in their work environment or choose not to report hospitalizations after a worker has been injured. As a result, OSHA raised the amount of fines companies must pay for unreported injuries. The previous fine of $1000 was raised up to $7000, which will rise significantly more in the near future. 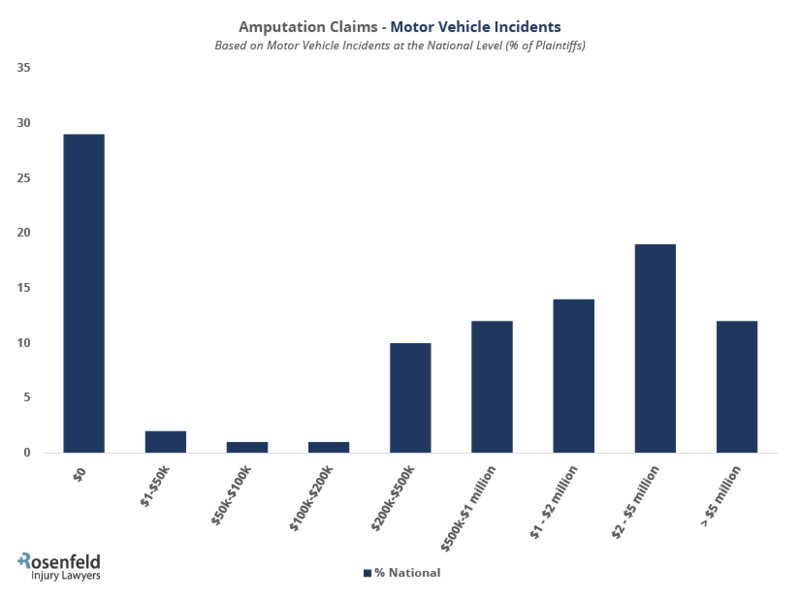 Vehicle accidents and collisions can cause severe injuries, including amputations, involving motorist, passengers, pedestrians, bicycles, motorcyclists, and truckers. Our law firm has successfully prosecuted many defendants at fault for causing a victim's amputation in an accident or event that involved automobiles, trucks, boats, trains, pedestrians, and public transportation. May 2018, Miramar Florida – The Miramar Homeowners Association miles north of the Florida Everglades will now pay millions in financial compensation to a woman who lost her leg after a snake bite. The woman's home in the Silver Shores community backs up to an undeveloped mitigation area that is a natural habitat for dozens of venomous snakes. The event occurred when the woman was out of her home. She was bitten on her big toe by a deadly water moccasin snake that was hiding in the sliding glass door track. The plaintiff agreed to a settlement of $5 million from the homeowners' association and their property management company. August 2016, Palm Desert, California – a young boy suffered life-threatening injuries that required his leg to be amputated, after being involved in a vehicle accident outside his elementary school in 2013. The plaintiff agreed to a $700,000 settlement by the defendants, where most of the cash will be available to him when he turns 18 years old. The victim was injured by flying debris while he was playing on the playground during recess outside his school. The 84-year-old defendant had been charged with driving under the influence but died two years later in January 2015 of natural causes, before the case could be resolved. March 2012, Brooklyn, New York – A 35-year-old Brooklyn mother who underwent amputation of her hands and feet ending a three-year legal battle by accepting a $17.9 million settlement from the hospital and city. The incident occurred in September 2008 while she was at the emergency room in the Brooklyn Hospital Center. The doctor's released her from the ER after prescribing painkillers for her diagnosed kidney stone. However, the next day the plaintiff called 911 twice after experiencing numbness and agonizing pain. This trip to the emergency room uncovered a life-threatening sepsis infection that had spread everywhere. While in the hospital, the mother lapsed into a coma as gangrene began spreading to her arms and legs. After waking from the coma, she realized both her feet and hands were gone, and she had lost partial vision in one eye. The plaintiff filed a lawsuit from her hospital bed which started a court battle that took years to resolve. January 2016, Honolulu, Hawaii – A homeless man agreed to a $7.2 million settlement from the state of Hawaii after claiming the state correctional facility acted negligently which caused the loss of both of his legs to gangrene. The plaintiff also claims that the facility failed to provide him proper medical treatment which resulted in the loss of fingers on each hand. Local news reports reported that the officers arrested the homeless man on an outstanding warrant in Kapiolani Park while sleeping in his car. Police reports indicate that the plaintiff had an open container of alcohol and had resisted arrest. The plaintiff received a scratch during the scuffle that later became infected. Sometime later, the victim fell ill and did not receive proper medical attention from his jailers. The illness led to gangrene in both lower extremities and hands that required amputation. September 2017, Macon, Georgia – A convicted murderer has agreed to a $550,000 settlement from the state of Georgia after losing his left leg from negligent care by the prison doctor. The plaintiff is a diabetic who is serving a life sentence. His attorney filed the inmate's lawsuit in federal court claiming that the 25-year-old prison doctor was deliberately apathetic to his pain and suffering and violated his eighth amendment rights under the U.S. Constitution. This amendment prohibits the government from imposing inhumane and cruel punishment. In 2012, doctors amputated the inmate's leg above the knee just six months after he was injured in a slip and fall accident on the kitchen floor. His diabetic condition made him vulnerable to infection. However, the prison doctor testified that she never noticed black necrotic tissue or a foul odor. Instead, she argued that she provided adequate treatment that included two rounds of prescribed antibiotics and a trip to the local emergency room. This legal issue is not the only problem the prison doctor faces. Another lawsuit has been filed in federal court where a plaintiff accused the doctor of failing to ensure his safety after abruptly cutting off his prescribed Xanax anti-anxiety medication. 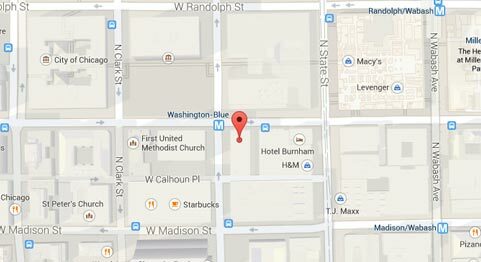 The man subsequently suffered a seizure and was transported to the hospital by helicopter to receive treatment. 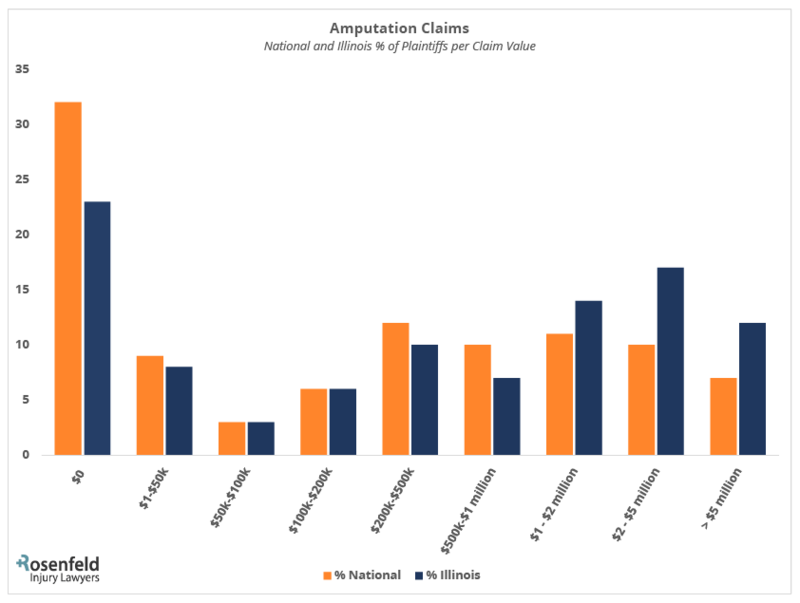 The following is a breakdown of what amputation claim plaintiffs have achieved by recovery range across various kinds of injuries at the Illinois and national level. This information has been compiled by the accident injury attorneys at Rosenfeld Injury Lawyers (888-424-5757) from jury verdict reporters, court records and publicly reported information. 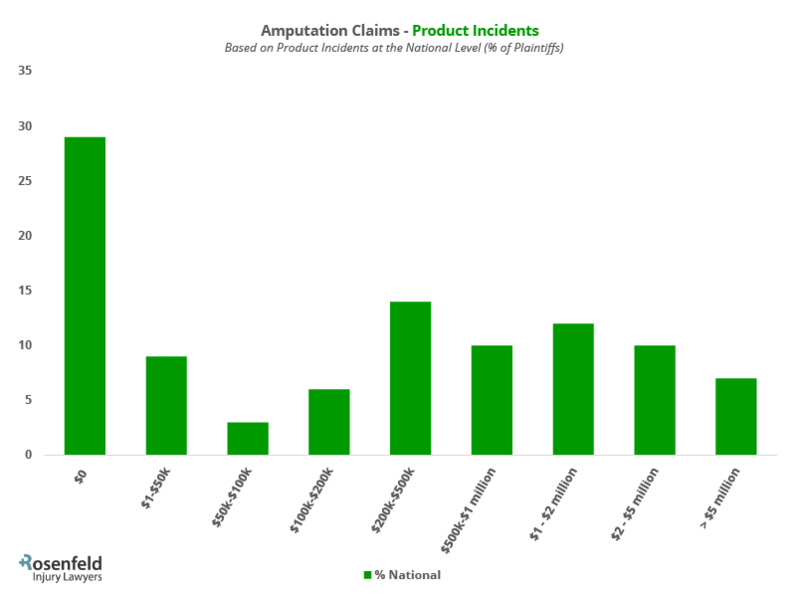 AMPUTATION CLAIMS AT THE NATIONAL LEVEL. Past, Current, and Future Medical Bills– You are likely facing massive hospitalization bills. These expenses typically represent only a small portion of your settlement value. Loss of Income– You likely are unable to perform your job duties in the capacity you once held at work. Our attorneys seek compensatory damages to reimburse you for the wages you have lost due to your injuries and temporary/permanent disabilities. Typically, we value the amount of compensation for lost wages based on reviewing your salary history including your vacation and sick time. 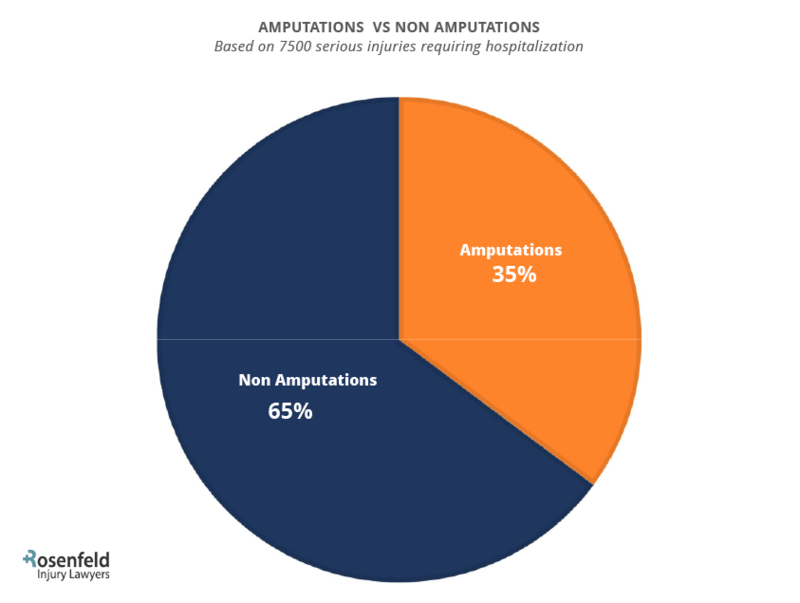 Loss of Potential Future Income– In many incidents, the amputation changed the victim's way to perform their daily activities. We use a complicated formula to calculate temporary or permanent disabilities and the inability to generate an income based on your previous pathway for advancement. We examine your position at your company and your chances for promotion to calculate your projected earnings and the impact your injuries have caused your ability to work at any job in the future. Pain and Suffering – We obtain compensation for the level of pain-and-suffering you have endured after your amputation and other injuries. We use a complicated pain multiplier that can place of financial value on the hurt you have suffered. Emotional Distress and Mental Anxiety – Likely, you have experienced incredible emotional distress and grief over your amputated limb, and had mental anxiety associated with worry in the unknown of what comes next. We use our proven methods for calculating a monetary value on the emotional strain you have endured. Loss of Consortium – Likely, the changes in your physical life is made difficult changes in your relationship with your companions, family, and friends. You and your loved ones have likely been deprived of the typical loving relationship you experienced before. Our attorneys can place a value on your loss of consortium to ensure you are fully compensated for the negative changes in your relationship. In some cases, where the actions of the defendants are so egregious, the judge will allow the plaintiff to sue for punitive damages to punish their negligent or intentional actions. Our team of personal injury attorneys fight aggressively on behalf of our clients to ensure they obtain all compensation available in their case. If you believe the negligent actions of another caused you to suffer damages that led to a wrongful amputation, Rosenfeld Injury Lawyers can help you file a compensation lawsuit against those responsible. Our team of attorneys has successfully prosecuted numerous amputation injury claims and obtained millions in compensation for our clients in cases just like yours. Contact our attorneys today to schedule a free, no-obligation case consultation to discuss the merits of your monetary recovery claim. Our legal team accepts all personal injury case, wrongful death lawsuit, and accident injury claims through contingency fee agreements. This arrangement postpones the payment of legal services until after we have successfully resolved your case through a jury trial or negotiated out of court settlement.